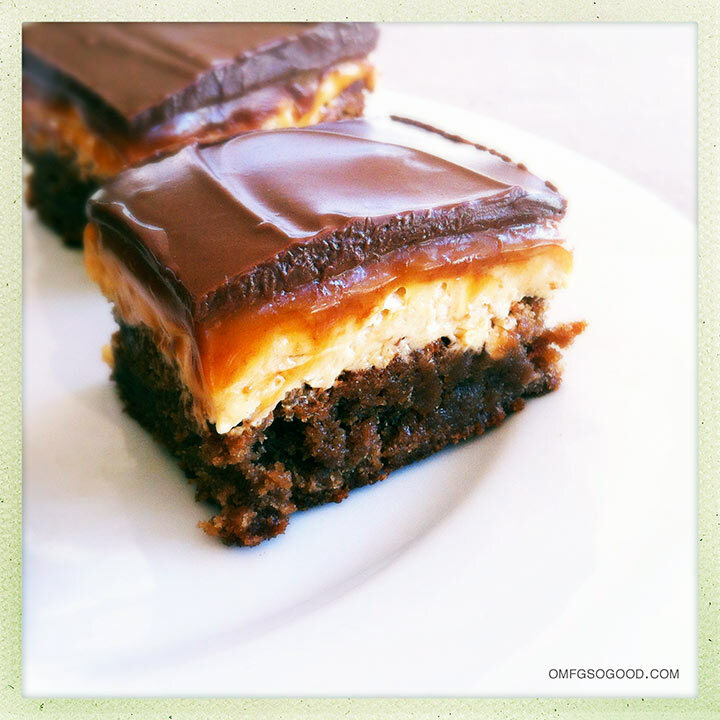 snickers bar brownies | omfg. so good. Holy. Crap. These are amazing. People tracked me on Twitter and stalked me wherever I went, all for a nibble of my signature version of the Crack Brownie. A layer of perfectly fudgy peanut butter and milk chocolate brownie, topped with what could only be described as the mother of all Snickers bars. I seriously woke up drooling. Lately I’ve seen a ton of Snickers Fudge recipes floating around Pinterest. 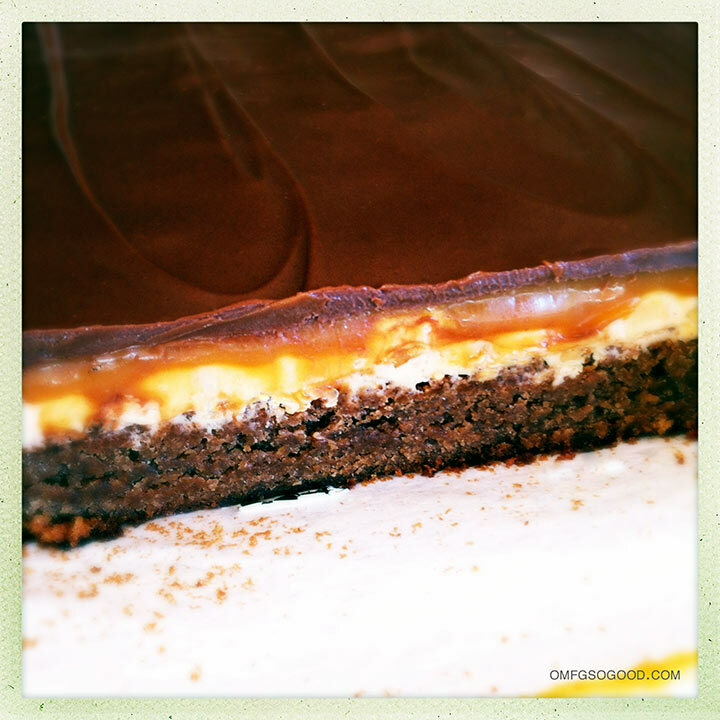 So, I started there, tweaked and refined, then added my own perfect fudgy brownie as foundation… for amazingness. To make the brownies, preheat the oven to 325 degrees and line a 9 x 13″ baking pan with parchment paper. In a microwave safe bowl, melt the peanut butter & milk chocolate morsels with the butter for 30 seconds, stir and melt for another 30 seconds. Stir to melt completely and smooth any remaining lumps. Add both the brown and granulated sugars. Whisk until smooth, then add in the eggs (one at a time) and the vanilla and whisk to combine completely. Add in the flour and salt and stir until combined, then spread in the prepared pan and bake in the preheated oven for 45 minutes (or until a toothpick inserted in the center comes out clean) Don’t overbake. These are a fudgy brownie, folks. Cool the brownies in the pan on a wire rack while you’re making the nougat layer. To make the nougat, combine the butter, sugar and evaporated milk in a heavy saucepan over medium heat, and whisk to combine. Bring to a boil, cook stirring constantly for 3 minutes. Remove from heat and immediately add in the marshmallow Fluff, peanut butter and chopped peanuts. Stir until incorporated. Pour the nougat over the room temperature brownies and gently spread to cover the brownies in an even layer. Transfer the pan to the freezer while you make the caramel layer. To make the caramel layer, add the caramel and evaporated milk to a small saucepan and cook over medium-low heat (stirring constantly) until the caramel is melted and smooth. Remove the nougat topped brownies from the freezer and pour the melted caramel over the top. Spread to an even layer and return to the freezer while you make the final chocolate peanut butter layer. To make the final layer, combine the milk chocolate chips and peanut butter in a microwave safe bowl and microwave for 30 seconds. Stir and heat for an additional 30 seconds, then stir to melt until completely smooth. 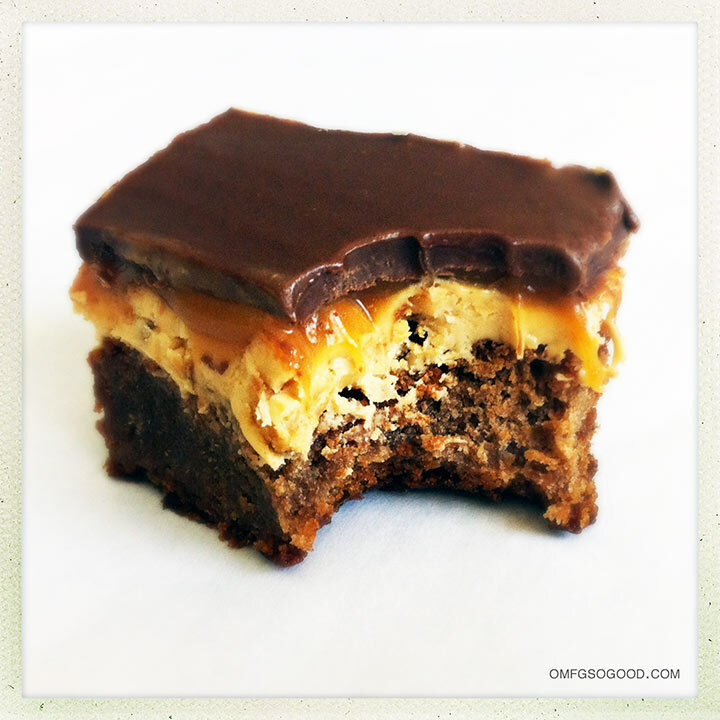 Remove the caramel & nougat covered brownies from the freezer and pour the melted peanut butter chocolate over the top. Spread to an even layer and refrigerate for at least an hour (or throw it back in the freezer if you’re really eager for a bite) before cutting into squares. These are super rich so I opted for smaller portions. But if you’ve got a massive sweet tooth, go big. Because, not gonna lie, we cut smaller pieces and then Jonny ate like five of them within the first hour. He was on such a sugar high that he managed to retile our master bathroom AND assemble the new under-sink cabinet, all on a whim. Now, if I make three more pans of these this month, maybe I can convince him to pimp out the other bathroom too. All while he’s under the Sugar Slammer Crack Brownie influence, of course. Saw these on Pinterest and made them for the 4th of July family reunion. They were a HIT! None left! ALL GONE! They started melting because it’s hot in July. LOL! 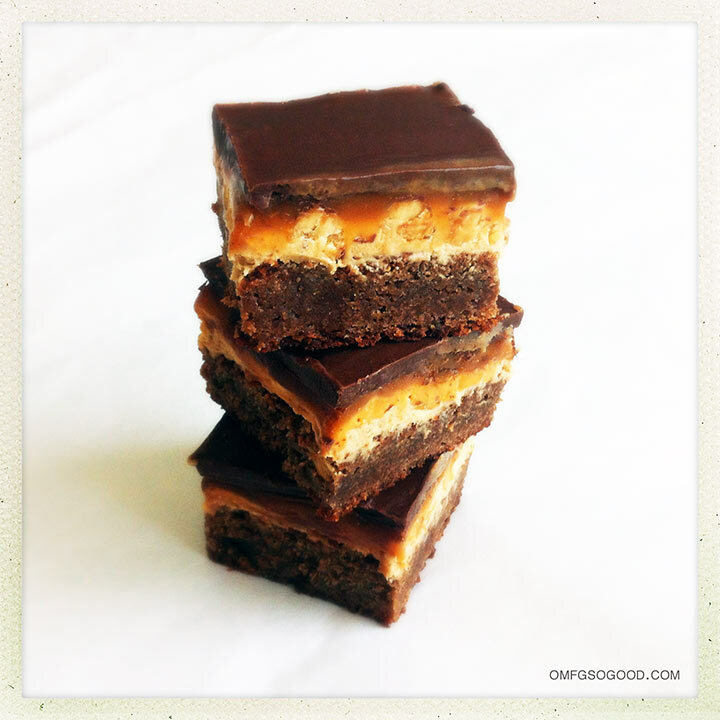 The only thing I will change is place the camel layer next to the brownie layer because when I cut them to serve, the brownie part came away from the nuggot layer…..still they were yummy! !